Data is the lifeblood of business. And in the era of digital business, the organizations that utilize data most effectively are also the most successful. Whether structured, unstructured or semi-structured, rapidly increasing data quantities must be brought into organizations, stored and put to work to enable business strategies. Data integration tools play a critical role in extracting data from a variety of sources and making it available for enterprise applications, business intelligence (BI), machine learning (ML) and other purposes. Many organization seek to enhance the value of data for line-of-business managers by enabling self-service access. This is increasingly important as large volumes of unstructured data from Internet-of-Things (IOT) devices are presenting organizations with opportunities for game-changing insights from big data analytics. 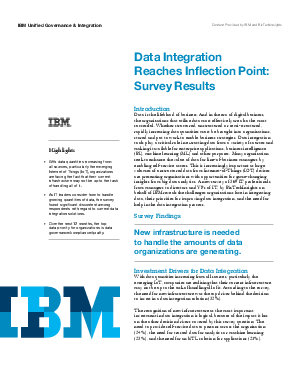 A new survey of 369 IT professionals, from managers to directors and VPs of IT, by BizTechInsights on behalf of IBM reveals the challenges organizations face in integrating data, their priorities for improving data integration, and the need for help in the data integration process.